Directions: Take Hwy 70 North to Alamogordo. Drive North through Alamogordo or take the Alamogordo by-pass. Take Hwy 82 East to Cloudcroft. 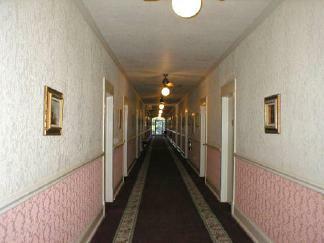 Constructed in the late 1800s, the Lodge was a by-product of the railroad construction nearby. Situated in beautiful surroundings, it was frequently visited by people across the country. Many famous people visited here. 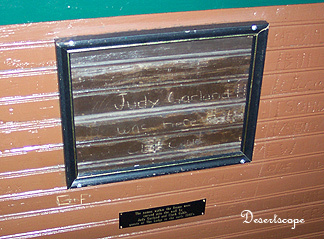 On the wall of the Lodge’s Tower, Judy Garland and Clark Gable carved their names during their earlier visit. The most famous visitor; however, was a beautiful red-haired chambermaid named Rebecca. Back in the sometime around the earlier 30’s, it was believed that Rebecca’s boyfriend found Rebecca with another man. He stormed out the Lodge in a rage of jealous. Soon Rebecca disappeared and no one knows about her whereabouts. Except that the employees and guests started to experience some strange encounters around the Lodge area. Strange sounds might be heard; things seemed to be misplaced by mysteriously; strange visits by a beautiful red haired woman were reported. My company hosted a Christmas dinner at the Lodge. We took this opportunity to stay there for a night. 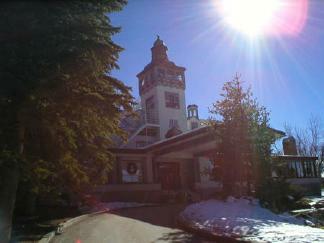 We arrived a little after 5:00 pm and we were amazed to find patches of snows still covered the areas outside the Lodge. The day was sunny but the air was cold. We got inside and checked in. We were given a set of keys to a second floor room. Walking past the shops, we saw the hallway ahead and a stairway leading to the second level. As we carefully ascended the staircase, the wooden floor boards creaked beneath our feet. Though immaculately kept, the Lodge seemed old and rustic. I couldn’t help but visualize people in the old fancy dresses walking up and down the hallway just as we see it today. The room was nice and warm, but a bit small and cramped by modern standard. We had a huge king sized bed on one side and a small day bed on the other. An old Television stood on top of the dark wooden draws (even with cable, the reception was not very clear). Through the fancy curtains, we could see the green pine trees standing tall and majestic in the white snow. I went to the small bathroom on the side and took a shower. At one point, as I was washing my hair, I noticed a single long strand of hair slowly swim toward me like a thin snake. I told myself that I must have read too much of those legends. We had dinner in the ball room. Then the whole gang of us started exploring the whole resort. First, one of our friends obtained the key to the Tower. We all rushed up there. Acting like a group of kids, we chattered and attempted to scare each other off with ghost stories. We checked out the log from the front desk. It contained all the strange sighting in the area, mainly of Rebecca’s ghost. Most of the stories were just a bit of silly; a few however, were quite strange. Reading part of it in top of the tower, we couldn’t help but to feel a collective cold chill. Once we got down, we parked ourselves at a guest area on the second floor overlooking the lounge. After a few more drinks, more ghost stories were exchanged. Just when we were talking about the recent movies, a friend of mine gasped as we all turned to see a small girl crawled up the stairs in her fours. Her long brown hair half covered her pale face. She was bare footed and wearing only a long white house dress. In the dimming light, she almost looked otherworldly. One of our friends had just seen the movie “The Grudge”. For a brief moment, she had though the girl from the movie had just appeared. It was late. We were reminded that other guests had retreated to their rooms. We finally went back to our room and slept. The night passed without incident. It was only the next day we found that several of our friends experienced some wired things. A few reported that the water temperature fluctuated when they took showers. One who had unintentionally insulted Rebecca said she dreamed that someone came to her bed, dragged her to the bathroom and tried to push her head into the toilet. Of course, she and her husband left in a hurry.